More American adults use Facebook than any other social media platform. But the bigger Facebook gets—almost 2.3 billion monthly active users, as of 2019, with similar levels of penitration here in New Zealand (3.1mill active users) — the more brands struggle to earn attention. As engagement drops and the number of posts rise, marketers need relevant, interactive content that rises above the noise. Like, for example, a Facebook contest. Running a contest is an inexpensive—and sometimes even easy—way to achieve measurable results for your Facebook marketing goals. We’ve gathered a few great Facebook contest examples to inspire you. That said, there are also a lot of ways—from obnoxious to outright illegal—that Facebook contests should not be run. Here we the Hootsuite team lay out how to plan and execute a contest that’ll thrill your audience and your analytics both. Facebook’s contest rules change regularly, so it pays to stay up-to-date. Facebook’s most recent updated contest rules break down into three major parts. In other words, Facebook isn’t going to help you avoid breaking state, provincial or federal laws by, say, accidentally running a lottery instead of a contest. Hint: a lottery includes any contest where participants are required to spend money to play, i.e., buy a product. One tried-and-true place to house all these regulations, notifications, and consents is a landing page. Landing pages have other benefits, too, which we’ll get into later. Here’s where the old rules fall by the wayside. Asking people to tag a friend or share a post on their timeline used to be a standard contest requirement. No more! That said, the benefits of these latest changes outweigh the inconveniences. Those practices were actually pretty annoying to most people. Decreasing the overall pollution on Facebook means a better experience for users, which means people will continue to use the platform (and enter your contests). One grey area is asking people to like your Page. Technically, this isn’t against the rules, but it’s not recommended because there’s no easy way to track the folks who have done so. That said, you can encourage people to like your Page and enter via a less suspect method. So, if our goal is to cut the crap and give the people what they want so that they love us, what do good contests actually look like? It depends on your business goals. Do you want to increase engagement with likes and shares? Or awareness with impressions? Or maybe you want to drive traffic to your website? Certain types of contests can pull double-duty. That is, they can focus on one of the above goals, and also collect user-generated content for your social media calendar, or crowdsource opinions, or gather high-quality leads for your sales team. Consider the following species of contest, and choose one that supports your objectives. Arguably the simplest contest to run is a giveaway. People are wowed by a desirable prize, and so they perform an action of your choice. The action can be as simple as liking the post or as complicated as producing a video. 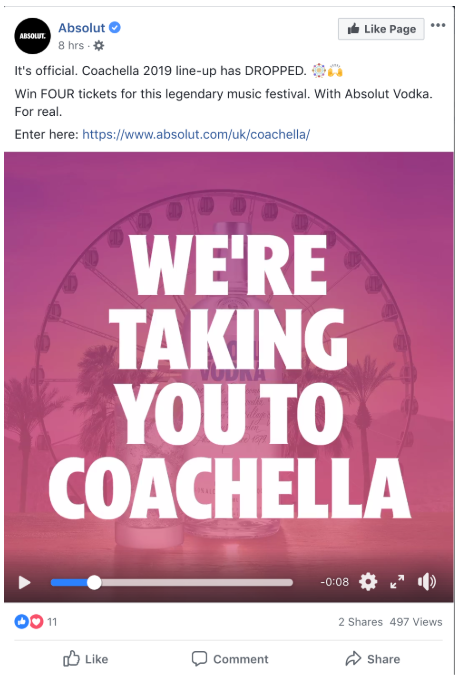 Absolut gave away an all-expenses paid Coachella weekend to fans in the UK. This probably felt like a perfect prize, at least until the calls to boycott the festival started. Still, this UK contest was so successful that Absolut ran an identical giveaway for American residents a month later. 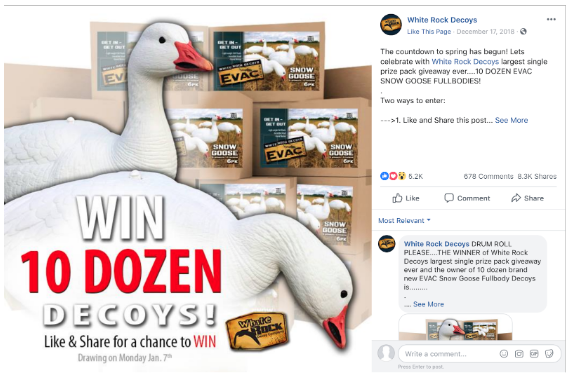 Meanwhile, to reach a slightly more specific demographic, this hunting store gave away a bunch—like really an unusually large number—of plastic geese. Unfortunately, as you can see below, they broke Facebook’s timeline rule by asking people to share the contest post. Think of it like this: if your goose fullbodies are alluring enough, people will want to share the news on their own without you asking. Add a twist to your giveaway by stretching it into a multi-day event. Not only will it make winning seem more likely, returning to your Page several times will increase audience retention, so that people will remember all those positive new opinions about your brand. To celebrate Chipmas, Kettle Brand did giveaways every day for four days. They asked people to comment naming their favourite flavour, and each day a winner was randomly chosen to receive either a case of their favourite flavour, or, on the fourth day, a year’s supply. Note that while Kettle Brand asks participants to @ a friend (Facebook specifically prohibits this!) they get away with it because it’s written in verse it’s a suggestion, not a requirement. 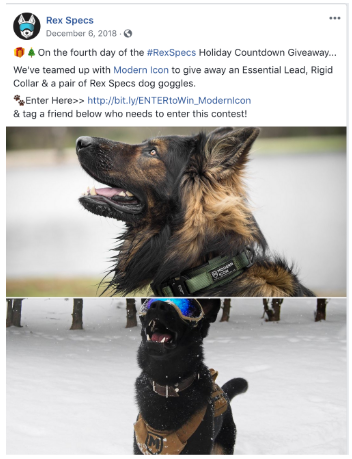 According to Maxwell PR, the campaign’s creators, the giveaway earned Kettle Brand 340,000 impressions (that’s around 18.9 percent reach, when the average organic reach for a Facebook post is 6.4 percent) and an impressive average engagement rate of 5.1 percent. You know what people love in this day and age? Feeling smart. Trivia, skill-testing questions, puzzles, quizzes. Anything that will make a complicated world feel coherent for one satisfying second. For instance, National Geographic asked a pretty tough question to feed excitement for the second season of its show Genius. Fans had to pay attention over five days to figure out the clues, which required knowledge of architecture, art history and European history. In return, Nat Geo offered an appropriately lavish—but nerdily specific—reward: a heavily-scheduled week in Spain (guided tour of the Alhambra and private flamenco lessons, anyone?). Photo contests are popular for good reason. Not only do they boost activity on your Page, with the right agreements in place, you get to tap into a source of user-generated content for your marketing calendar. 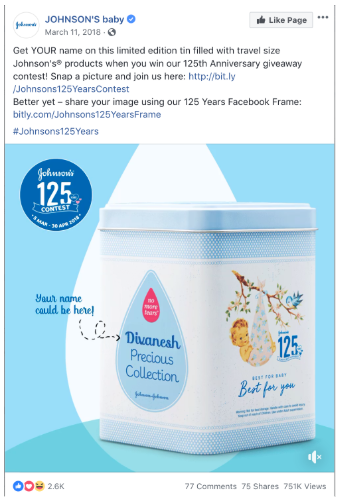 Johnson’s Myanmar received a ton of baby pictures—most of which came already came branded in the company’s custom Facebook Frame—in return for some customized tins. 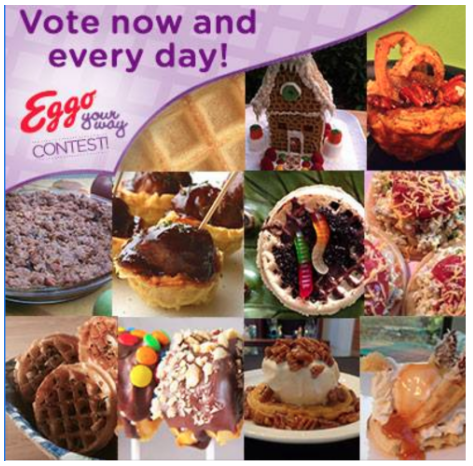 While Kellogg’s certainly got the social activity—and probably the sales, given the size of the cash prize—they were looking for, if we were in charge of this contest today we’d want to solicit photos that could be used in our social feeds down the line. Because what they got wasn’t always, um, pretty. On the opposite end of the scale, Skies Magazine doesn’t even offer a prize beyond public recognition. The Canadian publisher knows it can rely on the passion of amateur aviation photographers to provide a steady stream of quality images. Skies holds weekly contests on their Facebook page, and fans vote on their favorite photo. The winner is featured in their free daily e-newsletter. For more ideas, check out these examples of social media contests that resulted in great user-generated content. 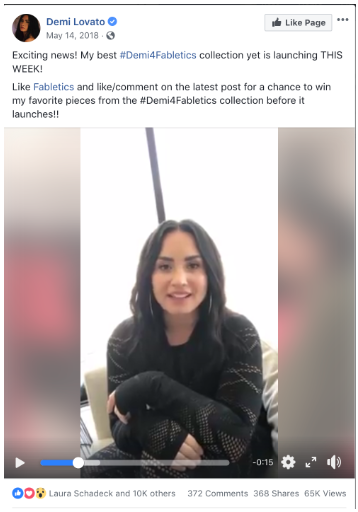 But what should my comment say, Demi? If you’ve already convinced people to make the effort to write a word or two, why not ask them to make those words meaningful? Gather insight on your business goals by asking for feedback on a new product name or ideas for improvement. Feed two birds with one scone! Even if you don’t have any burning questions for your customers (come on, yes you do) asking your audience to think creatively is more fun for them. They want to write a funny caption for that photo, fill in the blanks, or tell you their deepest desire vis-à-vis their scheduling software needs. And if you can find a way to include a picture of a baby animal, we highly encourage that. This is a subspecies of contest which gives the power to the people, rather than relying on random.org to choose the winner. 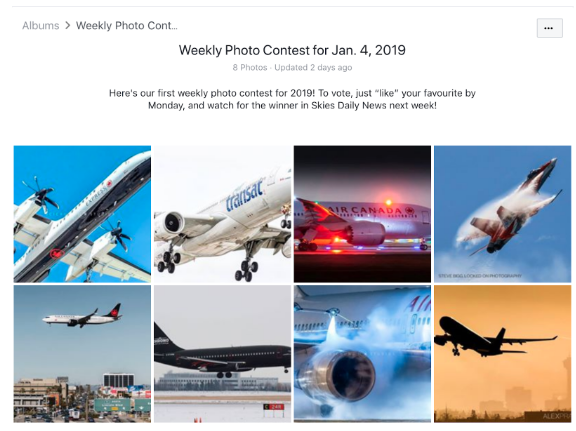 It’s especially useful if the contest is at all creative: people can vote for their favourite submission by Liking the relevant comment, photo, or post. The advantage here is that it encourages sharing without explicitly requiring it. For instance: if I want that duckling to be named Cage Pooper, I am going to have to tell all my friends to look at that post and vote for my comment that says the duckling should be named Cage Pooper. By now you probably have an idea or two as to what you can offer your audience, and what you can ask for in return, when it comes to your Facebook contest. Here are some best practices to keep in mind as you iron out the details. If you’re going to devote several days—or weeks!—to planning, promoting, administrating and customer-caring this contest, it should directly support the objectives of your Facebook marketing strategy. Once you’ve narrowed down your specific goals, it’s a lot easier to figure out what kind of contest you’re going to run, and how you’re going to run it. And because Facebook contests are very quantifiable, you’ll be able to prove your ROI after, too. You want your contest to attract people who will like your brand, not people who like large cash prizes (a.k.a. everyone). This is also known as the Don’t Give Away iPads Rule. Choose a prize that would appeal to your perfect customer. Your very own flagship product or service is often a great choice: contest participants will self-identify as people who are interested in what you have to offer. Yes, they might prefer your product when it’s free, but once they’ve imagined winning it they’ll have a better appreciation of its value. At the same time, the prize has to be intrinsically valuable enough that people will pause their eternal scroll and take the time to enter your contest. 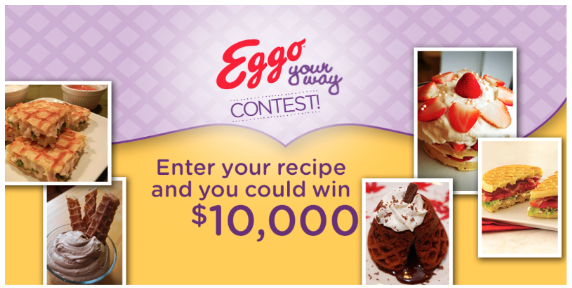 If you want to expand your contest’s reach by offering a more exciting prize, don’t select one randomly. Look at why people care about your brand. What values are they identifying with? What lifestyle are they aspiring to? This matters especially if you’re asking people to provide user-generated content: when we’re talking about their brand, things get personal. Ask yourself whether participating in your contest fits with who your audience is and how they’re already behaving on Facebook. One final note on knowing your audience: consider geo-targeting your posts so that you don’t annoy fans who live in ineligible places. If your contest requires a landing page, keep it as low-effort as possible. Form fatigue is real. Greedy forms asking for zip codes, salary ranges, and your boss’ phone number will lead to user drop-off, or blatant lying. If you are looking to filter out low-quality leads or content, a high barrier to entry (i.e., anything that involves more than two clicks) will scare off the half-hearted and noncommittal. If your goal is to gather truly amazing user-generated content, then yes, you can make the prize exceptional. 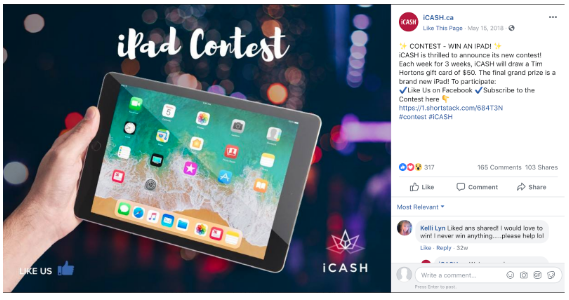 Asking people to write a story, (or, more practically, a review), take a photo, or make a video makes sense if you are breaking the Don’t Give Away iPads Rule by, um, giving away iPads. Alternately, if your goal is to gather great leads, make the task exceptionally relevant to your target demographic. Finally, in order to help your contest gain the traction it needs to reach critical mass, leverage your other marketing channels. Whether your contest is for Facebook alone, or is running simultaneously on your other social profiles, make sure to post about it, mention it in your newsletter, push it on your proprietary app, etc. As well, depending on your business objectives for the contest, it might be worthwhile to boost your contest as a paid Facebook post. Manage your Facebook presence by using Hootsuite to schedule posts, share videos, engage with followers, manage ads, and measure the impact of your efforts. Try it free today. 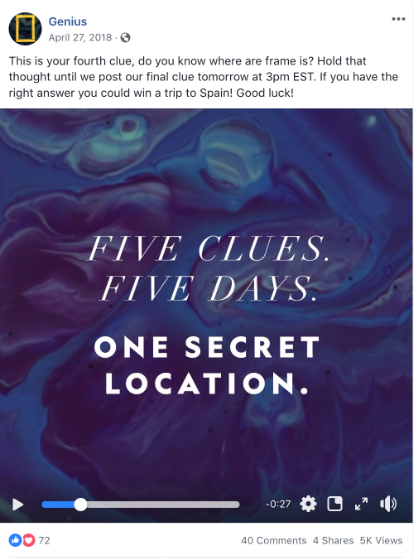 The post How to Run a Successful Facebook Contest: Ideas, Tips, and Examples appeared first on Hootsuite Social Media Management.